For Day One Ezekiel dresses in paint-spattered green cargo pants, an unadorned white t-shirt and Timberland boots. He carries a purple backpack embroidered with his older sister’s name. 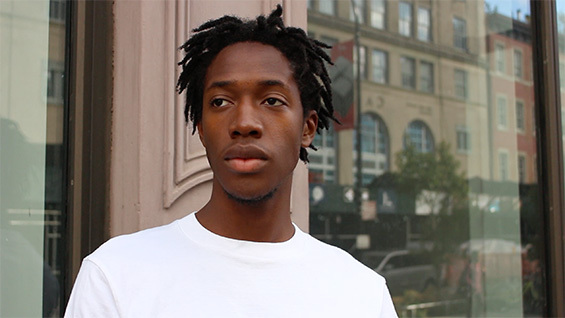 Like every other newly-arrived undergraduate student at The Cooper Union this year, Ezekiel's first-ever class is the one shared by all three schools. Within the first ten minutes of class Professor Maren Stange touches on a theme that will, over the week, and doubtless over the next five years, become a refrain from class to class, regardless of subject. "I expect you to take notes, by hand," Professor Stange tells the class. "It has been scientifically shown that writing by hand reinforces learning. Writing is thinking." She goes on to lay out the structure of the course: readings that will go in (general) reverse chronological order ending with Shakespeare, used as a tool to practice analytical thinking and writing, "further and deeper" than in high school. 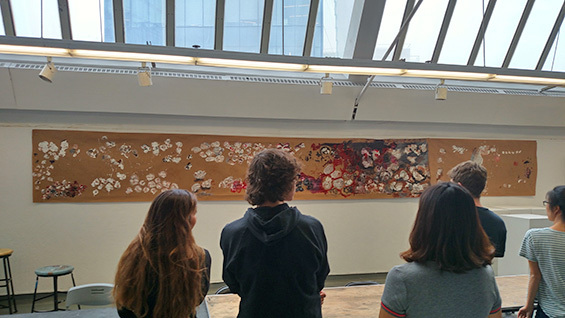 Immediately following Freshman Seminar Ezekiel heads to the third-floor lobby, where studio classes will eventually be pinning up their work for critique. For now chairs have been set in rows, facing a table, with the giant, floor-to-ceiling windows behind it. Small sandwiches and miniature cans of Coke and A&W root beer sit on a table. The general assembly invites all students to attend a round-robin of every faculty member giving brief overviews of each of their studios or classes. It is offered as "an appetizer for the coming year," Dean Tehrani explains later. Perhaps a little dazed, the new students finally meet for their first-ever studio class. And, unlike the other two schools at The Cooper Union, as well as most every other undergraduate program in the world, once they gather in a small lecture hall, one can take in that this one class is, literally, the class of 2022. These 12 women and 13 men will share every single studio, three per semester, for at least the next two years. Eventually they will graduate, the same group, more or less all together, in five years. Though Architectonics will more often regularly meet in the huge studio (simultaneously with all the other year’s foundation studios) for today the students sit in theater-style rows. At the front, the three co-instructors face the class. Notably, all three are women. Mersiha Veledar, assistant professor, who leads the studio, sits in the center, flanked by Yasmin Vobis, visiting professor II, and Alexa Tsien, assistant professor adjunct. In this abbreviated version of the studio, the course description is handed out and volunteers are asked to read parts of it aloud. After each reading the instructors elaborate ideas and provide examples. In doing so they provide a model in collaborative working, adding on each other's observations, waiting for each other to finish a thought. 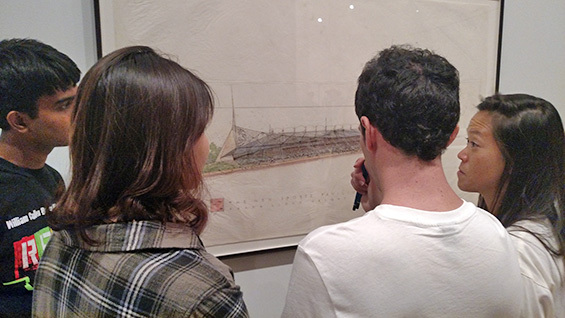 The course focuses on the use of points, lines, planes and volumes in the built world. Much of the studio will emphasize the iterative process of refining one's thinking and design. By the end students will have built three "physical structures" along with creating many, many drawings and absorbing a large body of writing. You must bring a sketchbook to class and fill it up. "I want you to start looking at details," Professor Veledar says, introducing another theme that will be reinforced by other courses through the coming days and years. "It's OK to be overwhelmed," Professor Veledar tells them, reassuringly. "We want to overstimulate you. We want to see you take risks. We will be here to guide you." Her overall tone, as with her co-instructors, is one of encouragement and affirmation. At the end, she makes sure everyone understands that the next class, on Thursday, will meet at the Museum of Modern Art. "Bring your sketchbooks!" A sixth-floor studio space of the Foundation Building flooded with the perfect overcast-sky light will likely not look this tidy for another year. Easels are bunched against freshly painted, unsmudged walls. The floor is swept. The co-instructors of the Freehand Drawing studio, Sue Gussow, professor emerita and Michael Morris AR'89, associate professor adjunct, have pushed together four long folding tables end to end and covered them with brown paper. The students soon learn that they will be divided into two sections. One will be taught by Professor Gussow and the other by Professor Morris for half the semester. Then they switch. A number of hands go up when students are asked who feels they don't know how to draw. Professor Gussow reassures them all that their skill level doesn’t matter much. The class returns to the “very, very, very basic” skills and concepts of drawing. Those with more practice, “must learn to tell yourself to get back to the beginning. In so many endeavors you must return to the basic tasks.” After an hour or so of going over the detailed tool requirements for each section and answering questions, it’s time to draw. Plastic cups of finger paint in hues of black, brown, white and red are distributed. A bag of popped corn is then opened and the kernels sprinkled down the table. 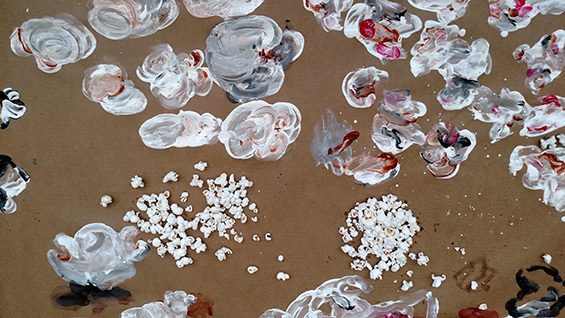 Students are instructed to pick a minimum of three kernels and “draw” them with the finger paints directly on the brown paper covering the table. After about 20 minutes the sheets are pinned to the wall. Splashes of paint stretch over 30 feet or so. It’s the first in-class work they have done at the school. They line up and look at it. A stranger would not likely identify anything as popcorn. But that seems to be point. The second exercise has students using the finger paints to create two portraits of a partner, “the way a blind person would feel someone’s face to get a sense of it. Do not draw an outline,” Professor Morris says. After it is over Professor Gussow asks if there were any surprises. Some students offer their reactions. “It made me think about what contribution the hand makes to the viewer.” “You had to work with accidents. That adaptation was refreshing. In digital drawing I would just ‘undo’ because I would see it as a mistake.” “I felt more connected to the work. I feel more constrained when I use instruments.” Professor Gussow pulls the threads together. “In drawing you must deal with the unintended consequences of materials. Notions of materiality in architecture are important. And using your hand makes its own impression on your brain,” she says, echoing similar words uttered by Professor Stange the day before. 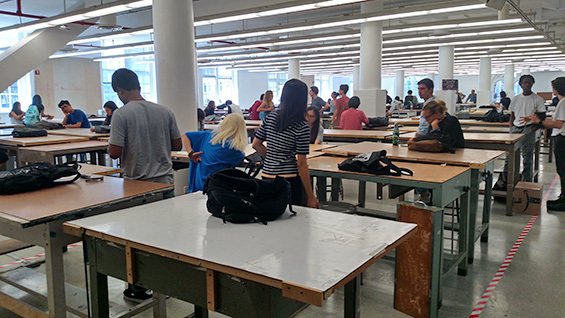 Because Freehand Drawing ended late the students have 10 minutes before their next class, another drawing studio. The room, on the third floor of the Foundation Building, is small, with walls designed for pinning and nothing but chairs set in a circle. James Lowder, associate professor adjunct who has taught at the school for eight years joins the circle and begins explaining what the class is about, touching on many themes that have already run through the other two studio classes. He points out that while other arts disciplines create the works they design (painters make paintings, sculptors make sculptures, writers write) architects do not make buildings. They draw. This particular class teaches drawing using instruments both mechanical and digital, focusing on geometrical shapes formed by points, lines, planes and volume. It is a course on “learning how to see.” In this class, he says, the students will make beautiful things but it will be demanding. Not excessively demanding, but “just demanding enough.” While in the past the work done in Descriptive Geometry never moved beyond just that class, this year the coursework will be designed to more closely match the assignments in Architectonics, in order to lessen the overall workload and foster a more integrated experience. Professor Lowder goes on to describe the first drawing assignment. It has exacting specificity including the required type of lead to use (2H) but to sum it up, students are asked to draw groups of both solid and dashed lines using five different line weights that form patterns and, ideally, express an idea. It’s due in two days. The second Freshman Seminar class uses James Baldwin’s 1953 essay “Stranger in the Village,” as a tool for exploring notions of authorial intent, the language used to communicate that intent, and how writing becomes an “iterative process” (see Architectonics, Day One). The discussion moves into the history of colonialism and current race relations and then returns back to writing. The homework is to read a second essay and write one of your own on how the two relate, focusing on issues that personally strike each student. The students gather in the lobby of the Museum of Modern Art. 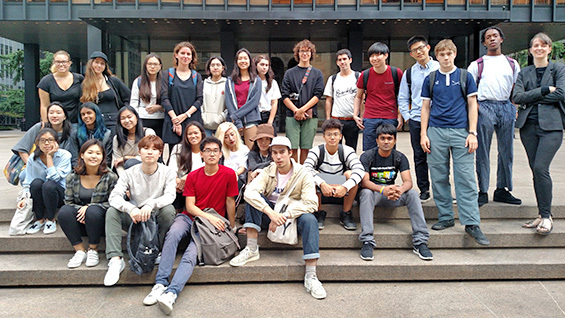 Though this studio typically takes place in the Foundation Building, the professors like to take the students out at the beginning to get them used to being engaged with the city and its cultural resources. It so happens that a special exhibition, Frank Lloyd Wright at 150: Unpacking the Archive, is in its last weeks at MoMA. But first, Professors Veledar, Tsien and Vobis usher the class into the sculpture garden. There they begin to provide real-world examples of themes of points, lines, planes and volume in the built environment. A wire chair, for example, is made up of lines. Nearby, another seat has been carved out of a boulder using straight, right-angle cuts, exemplifying volume. Above, a rectangular cutout in the building’s wall offers a peek at the steeple of an ornate stone church next door. It’s no accident that the church happens to be framed that way. And so on, the professors draw the student’s attention to details. Before sending them upstairs to the exhibition they assign them the task of drawing details that strike them in the show. Eventually everyone meets back in the lobby. They head out for a tour of notable buildings in the midtown area. They are taken past Eero Saarinen’s “Black Rock” CBS Building, Raimund Abraham’s Austrian Cultural Forum, Lever House (Skidmore, Owings and Merrill) and ultimately to the iconic Mies van der Rohe Seagram Building. In each case the professors point out numerous details that might be overlooked or taken for granted, like the way a planter starts outdoors and seems to go through the glass wall to continue in the lobby, and the air conditioning units installed inside the door frame so there would be no blocky AC unit over it. At the end they have each student lay their favorite sketch of the day out on the ground and talk about themselves and why they chose that particular detail. 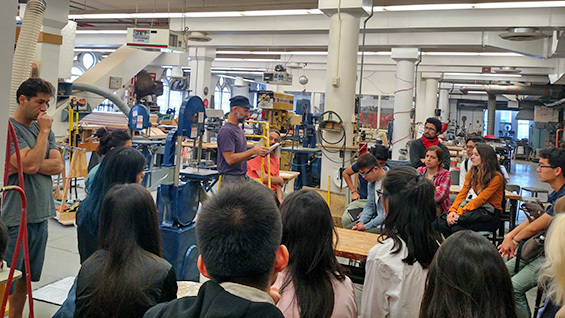 Held in the gigantic shop that occupies most of the fourth floor of the Foundation Building, the students gather around work tables and look out over dozens of currently idle machines for sawing, shaping, bending and affixing materials to build objects. Four technicians adept at woodworking, metalworking and plaster casting, but each with their own expertise, face the students. “This is ground zero for construction and making things,” Kevin Leonard, adjunct instructor and co-head technician of the shop, tells them. He outlines how over the semester the class will move through the three main work areas for basic instruction but that the shop is available to be used by anyone to learn anything whenever it is open. The playing of AC/DC’s “Hells Bells” signals clean up time at the end of the day. The “techs” are there to provide guidance and advice, as well as ensure safety. But what if, say, you have never welded anything before in your life? “Try it out,” Eric Monasterio, one of the shop techs says. “I’ll give you two pieces of scrap metal and you try it out.” The onus of the work, in other words, will always be on the student. Ezekiel and the others arrive shortly before class to pin up their assignments around the walls. They then take their seats in a wide circle. It’s the first critique of their design work. Professor Lowder walks clockwise around the room, examining the drawings. He hums to himself in the hushed room. The tune is unclear. After looking at each he returns to a few. At last he speaks. “Did everyone use 2H lead?” Silence. “ ‘No,’ is the answer.” So begins an eye-opening lesson in practiced detail observation. The class bunches together around each piece to get and give feedback. “Don’t put your name on the front,” is the first advice they receive thanks to a signature at the bottom of the first sheet. “Put it on the back.” This particular exercise puts emphasis on using tools to get consistency. He notes where drawings don’t clearly differentiate between five different line weights and where they do. He also makes note of where lines lose their sharpness. “At one end I see four lines and at the other end I see three. The line quality should look like God gave it to you. All anyone should see is a line.” He gives other advice: “Keep the paper crisp,” he says in front of a sheet that has some crimping, “it distracts from the work.” After reviewing the last work (his most common response is, “It ain’t bad,” followed by pointed feedback) he sends everyone over to 41 Cooper Square to a computer lab. Once each student has settled in front of a desktop computer stationed around the edges of the room, Professor Lowder goes over the syllabus now that he has use of a projector. He then goes on to show off some works by past first-year students that include hand drawings, digital works and models. “This class has no ideology outside precision,” he tells them. “Precision of thinking, precision of making, etc.” He reassures them that they will be making all these things too. Then he begins a half-hour lesson on using Rhinoceros (AKA Rhino), the modeling software, going over its basic principles and the shortcuts that students will find most useful. The last 20 minutes of the class are spent practicing. The homework assignment is a work created in Rhino and a second “attempt” at the hand-drawing assignment first gone over today. Ezekiel spends much of his weekend cooking in his apartment, preparing meals for the coming week and “being domestic.” He also visits the Whitney Museum and has an existential moment in the men’s room. For more details watch for our upcoming video conversation with the three participants of Week One. If they passed an AP calculus test, this is the one class that a student of the school could conceivably petition to credit out of to avoid the requirement. But they may not want to. The sympathetic and energetic Ruslan Trusewych, visiting instructor adjunct, holds an MFA but pivoted to work in the field of statistics. He promises the course will be taught more like a studio, with an emphasis on developing problem-solving skills, rather than a typical Calc I class. Everything in the course has a visual interpretation he tells them, perhaps as a way of reassuring those that consider themselves more artistically inclined. And so he dives right in, calling individuals to the board and asking them to think through a given problem like, True or False: the square root of AB equals the square root of A times the square root of B. (True. Plug in 4 & 9 for example.) Some have a go, Some admit they have no idea where to start. But they work each problem out with the help of their colleagues and the teacher. Then, in the midst of the class bagpipes are heard from outside. There is puzzlement from everyone, including Professor Trusewych until he suddenly realizes, “Oh. It’s 9/11.” The class stops. “Let’s pause a moment to reflect on that.” They all listen to the baleful moan until it just as suddenly ends and then they return to their work. Photos by Andrew Arnold/The Cooper Union, unless otherwise noted.